Well, I’ve actually been working too. Working for money, that is. The kind of work that gets noticed more. Part-time. And trying to buy a car. And doing BAS. And cooking mushy baby food every five seconds. And going to bridal showers and weddings and first baby birthdays and lots of other lovely things. Plus, there’s always the Mummy-ing. And trying to keep a marriage fresh and alive. And remembering to shave my legs, or to shower, at the very least. I’ve been doing that, too. But baking. Oh my. Baking has been k-i-l-l-i-n-g me. How women bake, I honestly do not know. I am in awe of women who bake. I salute women who bake. We are having a Naming Day for Ella, and since this will be a special day, I thought that I ought to bake a cake. That’s what mums do, right? A friend suggested it wise to do a practice cake first, and although it seemed like way too much effort to go through all those painstakingly detailed procedures twice, I did as I was told. She bakes stuff, this friend. And she’s known me since forever. I had to assume she was giving me this advice for a good, fine reason. If you have joined the Red Tent on Facebook, you too would have been surprised yet hopeful when you saw me holding in my eager little hands a cake tin. I went out to buy one and everything, which just by the way is no small feat, you guys. Do you know how many cake tins there are? Deep. Shallow. Square. Round. Latchy things on the sides. Super grip handles. It’s no wonder we suffer performance anxiety and doubt ourselves as capable women. I will never set foot inside another kitchen shop again unless it is on fire and I have to rescue someone. They are frightening places, those kitchen shops. Anyway, I drove all the way to one, selected a tin, paid the kind lady and left. What I really wanted to do was take the kind lady home with me and watch her while she made the cake, but she was probably taught stranger-danger when she was littler. She probably knows it’s never wise to indulge in anything other than idle chit-chat to strange, nervous, jumpy people in kitchen shops. 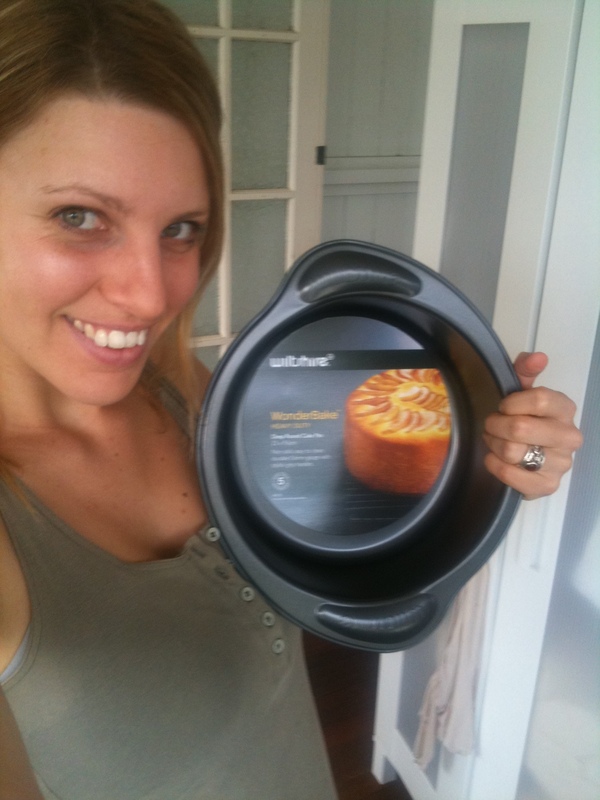 Here I am, full of pride, holding my new cake tin. I stayed optimistic for a whole hour, even, while I measured and sifted and beated and folded. I navigated my way through terms like “flat-bladed knife” and “fan-forced oven” with confusion but dedication. Do ovens have fans? How can one tell? How are knife blades flat? Does that mean non-serrated? None of our knives are sharp. Will they do, I wonder? And on it went. Baking is not for amateurs, you guys. You need utensils. You need skill. You need patience. You need to follow orders. It can make the average layperson sweat. Not to mention the mess it makes. I sprayed the egg whites all over the walls. 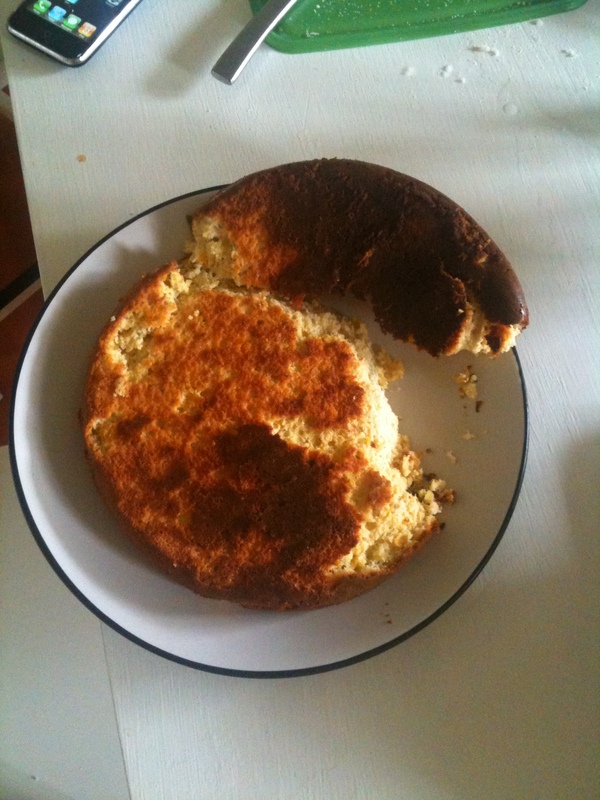 Anyway, I regretted making my baking attempt public Facebook knowledge, because after a disaster cake made its way out of the oven, I went into a 24 hour silence, only to be broken by messages like, “Hey Rach, how’s the cake?” and, “So are you going to invite me over for afternoon tea?”. I finally reported what had become of it, this sad cake of mine. And then you flooded me with tips and tricks and I remembered again why I love it so much in this tent. It’s just a cake, I know, but I always feel touched when people take time out of their day to help some one else along. I can’t remember who, but someone once said that we are not here to see through each other, we are here to see each other through. I know, it’s a cake, but it never really is. It’s always more. So thank you, my Martha Stewart friends. I covered my bodged-up cake with frosting, or icing, or whatever the heck it’s called and served it up for Joel’s Dad’s birthday which we sat down and ate this morning. And guess what? No one suspected a thing. They even said it tasted good. I’m on my way to becoming a fully fledged mum, you guys. I can bake now and everything.